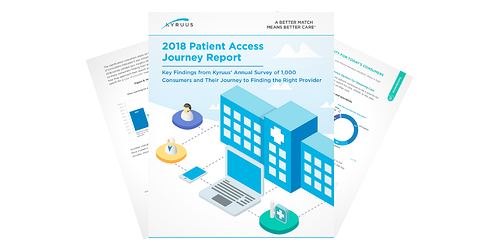 Boston, MA – Kyruus today announced findings from its annual survey of 1,000 consumers on how they find and book appointments with new providers. The findings, published in the 2018 Patient Access Journey Report, reveal that convenience is a growing priority for today’s healthcare consumers, but key criteria such as care quality indicators, cost, and brand also factor prominently in their access journeys. The findings highlight that health systems can improve competitiveness by meeting consumer demand for more timely and convenient access to care, while also resolving gaps in the scheduling process and delivering a cohesive access experience across the enterprise. For the second straight year, consumers commonly reported that they searched for a new provider online, but the majority again said they prefer to book appointments by phone. Convenience-related factors like location and appointment availability continue to feature heavily in consumer decisions about where to obtain care, though insurance accepted and clinical expertise remain the top criteria. New findings from this year’s survey also underscore the growing interest in alternative care sites, with almost half of respondents reporting that they visited a retail or urgent care clinic in the last year. Location convenience was the top reason cited for visiting clinics – reinforcing the need for integrated patient access strategies that not only unify access points, but also enable access to different sites of care. Appointment availability is critical for meeting demand: Availability is uniformly important across respondents: roughly four out of five consumers rated it extremely or very important. Further underscoring the importance of availability, 30 percent of consumers who visited a clinic in the last year indicated that they did so as a result of their primary care provider not being able to see them. Consumers weigh cost and quality: Insurance remains the top factor in provider selection, followed by clinical expertise. However, compared to 2017, the share of consumers rating cost as extremely or very important decreased 10 percentage points, while the quality of patient ratings and reviews rose five percentage points. Scheduling gaps pose barriers to patient access and satisfaction: While most consumers prefer to call to book an appointment (58 percent), only about 40 percent who called a hospital or health system to schedule one reported that they successfully booked an appointment on their first call. Online self-service continues to be important for younger generations: 58 percent of millennials and 64 percent of Gen Xers who prefer to book online would actually switch providers for the ability to do so compared with just 18 percent of baby boomers. Brand matters. Consumers value the reputation of the hospital/health system, with 68 percent rating it extremely or very important in provider selection. This finding, juxtaposed with the trend toward new care options, demonstrates that brand may serve as a differentiator for health systems as they expand sites of care. Kyruus conducted the survey of 1,000 consumers, who spanned ages 18 to 65 plus, in partnership with Wakefield Research in July 2018. All respondents searched for a healthcare provider for themselves in the last two years and represent an equal mix of private insurance and Medicare/Medicaid. To learn more about the survey findings, click here.